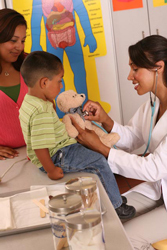 The extension of the Children's Health Insurance Program (CHIP). In California, the CHIP is known as the Healthy Families Program and provides low-cost health insurance for families with incomes at or below 250 percent of the Federal Poverty Level (FPL). It currently provides health insurance to more than 900,000 children across the state. Thanks to the new health care reform package, CHIP will be extended until 2019. Click here to learn about some of the problems Healthy Families may face in California, despite the new health care legislation. A substantial new investment in home visitation programs for birth to 5 year olds. The legislation will dedicate $100 million in FY 2010 to expand or establish home visitation programs in high risk communities. Funds will increase to $400 million per year over the next three years, and will be distributed based on population formulas. This funding, directed to State Maternal and Child Health Departments, is compatible with place-based models of funding like those articulated in First 5 LA's new, five-year strategic plan. A variety of models will be eligible for the funding. Public health prevention activities. Funding for identifying and treating maternal depression is provided. Also, the law provides additional support for community health centers, which play a vital role in expanding access to preventive and other care in our nation's most vulnerable communities. Additionally, the reform provides $500 million for prevention, wellness and public health activities. Preventing insurance companies from denying coverage to children with pre-existing conditions. The new law prohibits health care plans from placing lifetime caps on benefits; and barring insurance plans from dropping people's coverage when they fall ill.
As a founding member of the Children's Health Initiative of Greater Los Angeles County and an advocate for comprehensive, affordable health care coverage for children, First 5 LA applauds President Barack Obama, members of L.A. County's congressional delegation and House Speaker and California Rep. Nancy Pelosi for their successful efforts to pass health care reform. We look forward to their continued support for California children and families. For more information on health care reform, please contact Palanda Brownlow, policy analyst, at [email protected].